Stenter Machine Chain Manufacturer, Stenter Machine Manufacturer. 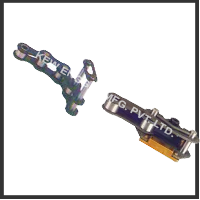 We are a leading Manufacturer and Exporter of High tech Stenter Machine Chain. Quality Raw Material for Stenter Machine Chain for strong stretching and heavy fabric. Genuine Design of Chain suitable for Stenter Machines Artos, Harish, Yamuna, Dhall, and many more. Slitter Rewinder Machine Manufacturer for different type of materials. KEW. ENGG. & MFG. PVT. LTD is a company engaged in Manufacturing, Exporting & Supplying of Chain Link Bottom Parts i.e. Stenter Clip, Stenter Chain from Ahmedabad, Gujarat, India. We are winner of 3 times National Award and 2 times International Award for Quality manufacturing. © 2016 www.stentermachineclip.com | All Rights Reserved. Imitation, Copying or Using Photographs or Text from this Website is a Punishable Offence. KEW reserves the right to change specifications & design without prior notice to incorporate latest development.